If you live in Blaine Minnesota and have reasons of concern about a possible pest infestation, it would be wise to call an exterminator. It’s better to handle the insect dilemma sooner than later. 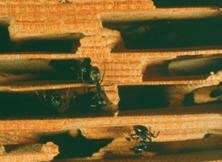 Pests reproduce at an alarming rate and are constantly in need of a comfortable place to ensure safe multiplication. So, of course they’re going to see your home as a much better environment for nesting than our Minnesota ‘not so nice’ weather. Which means they aren’t going to crawl out as easily as they crawled in, the masses will stay till the very end, even if it means damaging a major investment, your home. At Ecotech, we understand that your home is where your heart is and you would never cozy up to the thought of sharing it with bugs, neither would we! We have your solution. Once you call the professional exterminators at Ecotech, we will come out and thoroughly examine the multitude of pest, where they entered, where they are continuing to breed and any other areas that have been affected by the pests. Our exterminator will then devise a plan to get rid of each and every bug. Because all infestation are different, there is not one ’go to’ plan right for all situations. Not only will we kill them but we will make sure that they will not infiltrate your domain again. Many times pests leave an area torn apart. It is important to repair any damages so other pests don’t find their way into your home as well. Whether the harm they caused in the interior or exterior, we can repair it. From start to finish, Ecotech has the safety of you, your family and your home in mind. Give us a call at 763-785-1414 today, if you need one of our specialists to evaluate your current pest situation, or if you are in immediate need of extermination call our 24/7 phone lines at 612-237-8282 or 763-732-7296.